Oddly enough, there is a few exchange websites out there today that are based in Singapore/Malaysia. This is because, in the region, BTC trade is accepted by the majority of the people living there. Even though not all governments in the region fully embrace the new currency, the volume of traders from the region has naturally enabled the growth of local BTC exchange websites and services. Today, we will be looking into one of the locally grown websites within the Southeast Asian region. The website we are reviewing today is Singapore.belfrics.com. Come join us as we take a look at their website features, what their services are, and what their website offers in general when it comes to BTC transactions. Without further delay, let’s talk about that! Belfrics Global Sdn Bhd was founded in 2014 and specializes in Bitcoin Exchange. Their headquarters is located in Suite #B1-16-6, Soho Suites, @KLCC, Jalan Perak Kuala Lumpur, Wilayah Persekutuan, 50450 Malaysia. Since its foundation, Belfrics has provided services to countries like Malaysia, Singapore, Dubai, Hong Kong, Indonesia, China, India, and Kenya. At this point of the review, we know quite little about the website! That is why we need to create an account with them and explore it with us. 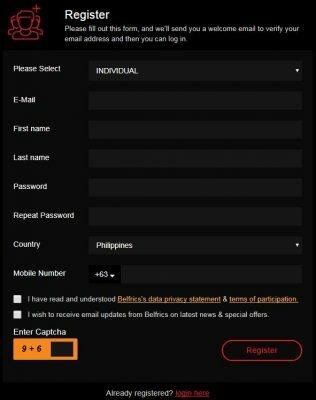 To create an account with Belfrics.com, we, of course, need to head on to their website and click on sign up to create an account. The registration tab contains a few things that a customer needs to provide. This includes the account type (Individual or Corporate), active email address, first and last name, the password for the new account, country of residence and your mobile number (must coincide the country of residence). Default accounts (accounts that did not go through the verification process) will only have a limit of BTC 0.5 withdrawal limit per day. To increase the maximum withdrawal limit, the user needs to provide verification requirements to raise it to BTC 50 per day and up to 500 per month! Naturally, we immediately explored their security features and found out that they do offer Two-Factor Authentication for registered user accounts. This feature can be adjusted in the account settings found under the account tab. Through this tab, users are able to add mobile verification and Google Authenticator into an existing Belfrics account. Not all, but some of the exchange website today offer wallet services to their registered account holders. Good thing that here in Belfrics they offer that kind of service. 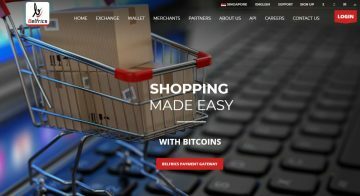 Aside from the fact that the website offers exchange services for BTC, they also cater to merchants and offer payment gateway options. Aside from being a straight exchange website for cryptocurrency, Belfrics.com has proven that you get more than just an account that is ready to exchange. 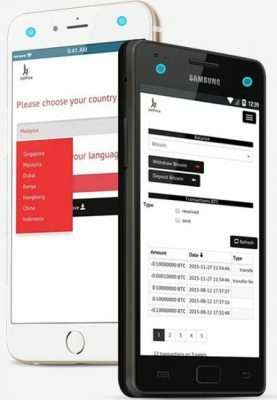 What’s even great is that they also provide mobile Apps for traders that want to get instant access to the platform wherever they are! To read more about their mobile platform, please click this link. Please be advised that before any trade can be done on the website the KYC documents need to be uploaded before everything else. The page wherein you will find this requirement is the first thing you see once you have logged into your account for the first time. KYC requirements include ID proof, proof of Address, bank documents, and additional documents to support your identity. Once this has been provided, the account will then be able to either buy or sell BTC for USD. 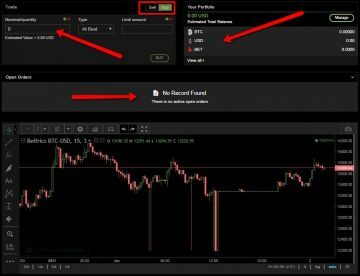 The trading platform is actually really easy to use since you only need to provide the amount of BTC in the space provided and enter the limit buying/selling amount. Successful orders will be placed under the “Open Orders” tab just right below the order tab. Their exchange platform is pretty basic compared to some of the exchange website today. Everything is where it is supposed to be and it would not be hard for a new trader to understand which is which. We, however, suggest that if you are new to BTC exchange website, please do read more about it to have a good base knowledge of how everything goes. When it comes to fees, the website charges 0.50% fee on traded volume per transaction. With this being said, verified customers are also welcome to say goodbye to their deposit and withdrawal fees because that doesn’t exist here at Belfrics.com. How do we get our funds in and out of the website? Compared to other exchange websites out there that only accept Fiat deposits, Belfrics.com does the opposite and provides two options for their users to choose from. This means that a registered user is now able to fund their account through wire transfers or BTC deposits. When it comes to withdrawals, they basically have the same options for deposits and withdrawals, the only difference would be the website that you are visiting. Please be advised that different websites of Belfrics.com have different options to choose from. They have an email support channel which customers with concerns are able to contact at support@belfrics.com or visit their Singapore location at One Raffles Place Tower 2, Level 19 & 20, 1 Raffles Place, #20-61 Tower 2, Singapore 048616. The website also supports live chat, which can be accessed through their website by clicking on the “Leave a message” tab on the lower right-hand side of the website. They also have accounts on Facebook, Twitter, and Instagram. In general, we found a lot of advantages if people would create and trade with Belfrics.com. Again, this is just our opinion and we would like to hear from your personal experience in the comments section below. The website is solid and has a lot of features that a user can take advantage of! If they had a lesser trading fee, they can easily take the exchange world by storm. stay away unless you want to be cheated. There is barely any volume in this exchange and you will find that they have listed scam coins on their market place. One of their coins claims to have over 200k users but there is zero volume on a daily basis since launching. They(belfrics) barely does any research or investigation on their clients that they list. Why havent they delisted the token, is beyond reasoning to me, unless there is something amiss. This is clear evidence that they are colluding with scammy projects to list them without prior due diligence. I am sure if anyone did their digging into them they will find more evidence that it’s a scammy exchange.